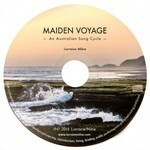 Maiden voyage : an Australian song cycle / Lorraine Milne. Maiden voyage : an Australian song cycle / words and music : Lorraine Milne ; additional words: Lois Ellis. Maiden voyage : arranged for mezzo-soprano, 3-part female choir and piano / words and music by Lorraine Milne ; additional words by Lois Ellis. Maiden Voyage is a song cycle about the achievements of Australian women, both general and specific, throughout the history of white settlement. Women such as Louisa Lawson (Henry's mother) and Mary Penfold (the "mother" of Australian wine) are included along with Good Old Mum and Birthday Ballot, a song about the Vietnam War. Musically, the harmonic language is modern tonalism incorporating jazz elements as well. Instrumentation: Mezzo-soprano, alto, piano. The cycle can be sung by a single female voice (mezzo soprano) with piano accompaniment. Difficulty: Medium — Amateur or professional. Contents note: 1. Shifting south -- 2. Quiet courage -- 3. Thank 'em for Aussie wine -- 4. Oh Louisa -- 5. A woman in the house -- 6. Australian air -- 7. A matter of survival -- 8. A woman is not the right man -- 9. Who cares! -- 10. The little woman -- 11. Birthday ballot -- 12. No value -- 13. In the end. Words and music by Lorriane Nilne ; additional words by Lois Ellis. Some songs are for one voice with piano. 7 Mar 97: International Women's Day, Queen Victoria Women's Centre, Melbourne, Victoria. Featuring Rose Peterson, Lorraine Milne.